How do I add an existing association/dependency to a diagram for an element that is already on the diagram. 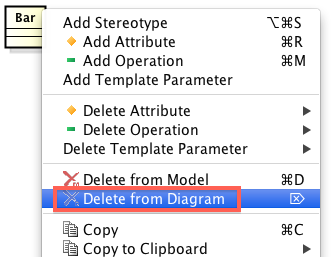 For example, I have an existing class diagram that contains the classes Foo and Bar. There is a association from Foo to Bar that is not displayed in the diagram that I wish to show. I can see this association in Foo's association list but cannot see any way to add it to the diagram. I do not wish to add all of Foo's associations as I've purposefully removed some of the relations from the diagram. There are a few ways to do so. Then the association between Foo and Bar classes should appear. 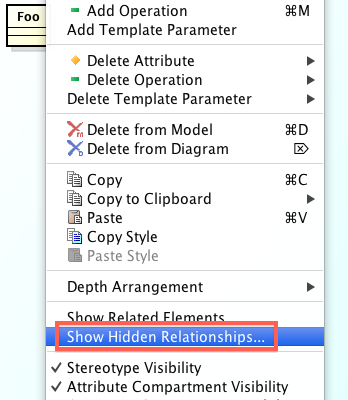 1) If you are using Astah UML or Astah Professional edition, select either Foo or Bar class, and then select [Show Hidden Relationships] from its Pop-up menu. 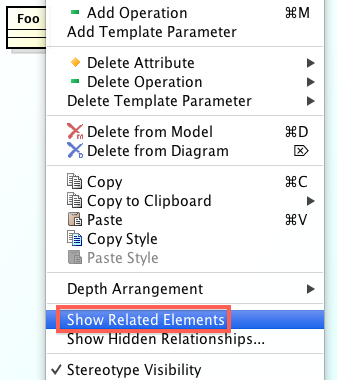 FYI, if you select [Show Related Elements] instead of [Show Hidden Relationships], all the existing associations that the selected class contains will be added to the diagram which you do not want in this case I suppose. Hope this helps. If you have any questions or problems, please let us know. When you do, please let us know which edition & version of Astah you are using. So that our response would be more proper. (The latest version, Astah 6.5 is used in this response.) Thanks.